Licensed under a Creative Commons Attribution-Share Alike 3.0 United States License (see http://creativecommons.org/licenses/by-sa/3.0/us/legalcode). Spice is an open remote computing solution, providing client access to remote displays and devices (e.g. keyboard, mouse, audio). The main use case is to get remote access to virtual machines, although other use cases are possible and in various development stage. The following sections provide basic information on Spice components and features, obtaining, building installing and using Spice. 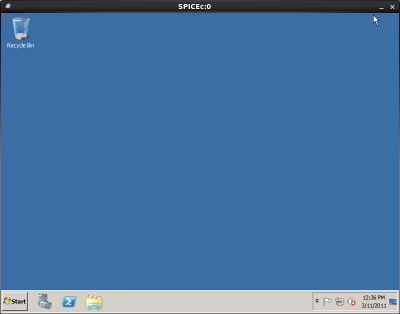 Spice server is implemented in libspice, a VDI pluggable library. Currently, the main user of this library is QEMU. QEMU uses spice-server to provide remote access to virtual machines through the Spice protocol. Virtual Device Interface (VDI) defines a set of interfaces that provide a standard way to publish virtual devices (e.g. display device, keyboard, mouse) and enables different Spice components to interact with those devices. On one side, the server communicates with the remote client using the Spice protocol and on the other side, it interacts with the VDI host application (e.g QEMU). The Spice client is a program which is used by the end user to access remote systems through Spice. The recommended client is remote-viewer (which is shipped with virt-viewer). GNOME Boxes can also be used as a Spice client. spicec is an obsolete legacy client, and spicy is only a test application. Spice server supports the QXL VDI interface. When libspice is used with QEMU, a specific video PCI device can be used for improving remote display performance and enhancing the graphic capabilities of the guest graphic system. This video device is called a QXL device and requires guest QXL drivers for full functionality. However, standard VGA is supported when no driver exists. The Spice agent is an optional component for enhancing user experience and performing guest-oriented management tasks. For example, the agent injects mouse position and state to the guest when using client mouse mode. It also enables you to move cursor freely between guest and client. Other features of agent are shared clipboard (copy and paste between guest and host) and aligning guest resolution with client when entering fullscreen mode. The Spice protocol supports a communication channel between the client and the agent on the server side. When using QEMU, Spice agent resides on the guest. VDI port is a QEMU PCI device used for communication with the agent. The Spice protocol defines the messages and rules for the communication between the various Spice components. Spice offers several image compression algorithms, which can be chosen on server initiation and dynamically at run-time. Quic is a Spice proprietary image compression technology based on the SFALIC algorithm. The Lempel-Ziv (LZ) algorithm is another option. Both Quic and LZ are local algorithms encoding each image separately. Global LZ (GLZ) is another proprietary Spice technology that uses LZ with history-based global dictionary. GLZ takes advantage of repeating patterns among images to shrink the traffic and save bandwidth, which is critical in a WAN environment. Spice also offers an automatic mode for compression selection per image, where the choice between LZ/GLZ and Quic is heuristically based on image properties. Conceptually, synthetic images are better compressed with LZ/GLZ and real images are better with Quic. Spice uses loss-less compression for images sent to the client. However, video streams are handled differently. Spice server heuristically identifies video areas and sends them as a video stream coded using M-JPEG. This handling saves a lot of traffic, improving Spice performance, especially in a WAN environment. However, in some circumstances the heuristic behavior might cause low quality images (e.g. identifying updated text area as a video stream). Video streaming can be chosen on server initiation and dynamically at run-time. Spice supports two mouse modes: server and client. The mode can be changed dynamically and is negotiated between the client and the server. When a user clicks inside the Spice client window, the client mouse is captured and set invisible. In this mode, the server controls the mouse position on display. However, it might be problematic on WAN or on a loaded server, where mouse cursor might have some latency or non-responsiveness. Not captured and is used as the effective pointing device. To enable client mouse, the VDI host application must register an absolute pointing device (e.g. USB tablet in QEMU). This mode is appropriate for WAN or or for a loaded server, since cursor has smooth motion and responsiveness. However, the cursor might lose synchronization (position and shape) for a while. when using the QXL driver, the resolution of the guest OS will be automatically adjusted to the size of the client window. Spice can be used to redirect USB devices that are plugged in the client to the guest OS. This redirection can either be automatic (all newly plugged devices are redirected), or manual (the user selects which devices (s)he wants to redirect). data from smartcard that are inserted into the client machine can be passed through to the guest OS. The smartcard can be used by both the client OS and the guest OS. between video and audio. Available only when video streaming is enabled. I’ll use qemu-kvm as a name for the executable. If you’re using a manually built qemu or a qemu without kvm then just replace qemu-kvm with your own binary. I’ll use host$, client$ and guest$ shell prompt notations to distinguish where the command should be the command. See section [glossary] to be sure that you know difference between the host, client and guest. You can ignore the difference between guest, client and host if they are all running on the same machine. The first thing to do is to create a guest image. You can use any raw device such as a clean logical volume, or an iSCSI lun. You may also use a file as the disk image for the guest. I’ll use a file created by qemu-img as a demonstration. The following command will allocate a 10GB file. See qemu-img man page for further information. Now that we created an image, we can now start with image population. I assume that you have a locally stored ISO of your favourite operating system so you can use it for installation. Let’s take a brief look at the qemu options that were used. The option -boot order=dc specifies that the guest system should try to boot from the first cdrom and then fallback to the first disk, -vga qxl specifies that qemu uses a qxl graphics device. The Spice port option defines what port will be used for communication with the client. The Spice option disable-ticketing is specifying that ticketing (simple authentication method) is not used. The virtio and chardev devices are required by the guest agent. This section will assume that you already have a running QEMU virtual machine, and that you are running it either through virt-manager, libvirt or through direct QEMU use, and that you want to enable Spice support for this virtual machine. Double-click on the virtual machine you are interested in, go to "View/Details". If the left pane has a "Display Spice" entry, then the virtual machine already has Spice support, and you can check the connection details (port number) by clicking on it. If it has no Spice entry, click on "Add Hardware", and add a "Graphics" element of type "Spice server". If the host and the client are not the same machine, you should check the "Listen on all public network interfaces" checkbox, otherwise you don’t need to make any changes. You should also add a QXL video device. It can be done by double-clicking on a virtual machine, then by going to View/Details, and by clicking on "Add Hardware" if the virtual machine does not have a "Video QXL" item in its left pane. From the "Add hardware" dialog, you should then create a "Video" device whose model is "QXL". After stopping and restarting the virtual machine, it should be accessible with a Spice client. You can remove non-Spice display entries and non-QXL video entries from the virtual machine configuration. If you go to "Edit/Preferences/VM Details" in the main virt-manager window, you can set Spice graphics type as the default setting for new virtual machines. All libvirt examples will assume that the virtual machine to modify is $vmname and that virsh is using the correct libvirt connection by default. This will setup a Spice session listening on port 3001 exporting your virtual machine display. You can also add a QXL device by appending -vga qxl to the command line. The following section will show you basic usage of the Spice client. The example connection will be related to the qemu instance started in the previous sections. Be aware that the port used for spice communication (port 3001 in our case) should not be blocked by firewall. Host myhost is referring to the machine which is running our qemu instance. Spice does not support multiple connections to the same QEMU instance by default. So anybody who will connect to the same host and port can simply take over your session. You can solve this problem by using ticketing. Ticketing is a simple authentication system which enables you to set simple tickets to a VM. Client has to authenticate before the connection can be established. See the Spice option password in the following examples. To set a Spice password for a virtual machine, go to this machine details in virt-manager, and then click on the "Display Spice" item in the left pane, and enter the ticket you want to use in the "Password" field. When you start the client as usual, if ticketing was enabled on the host, remote-viewer will pop up a window asking for a password before starting the Spice session. It won’t be established if an incorrect ticket was passed to the client. You might have figured out that passing tickets as a command-line option isn’t very safe. It’s not safe as everybody with access to the host can read it from the output of ps(1). To prevent this, the ticket can be also set by using the QEMU console command spice._set_ticket. The agent is a daemon/service running in the guest OS so it must be installed if it was not installed by default during the guest OS installation. It also relies on a virtio-serial PCI device and a dedicated spicevmc char device to achieve communication between the guest and the host. These devices must be added to the virtual machine for the agent to work in the guest. The needed devices can be added from the virtual machine details. Click on "Add hardware" and then add a "Channel" device with type "Spice agent (spicevmc)". This will automatically add the needed virtio-serial device in addition to the spicevmc channel. With USB redirection, USB devices plugged into the client machine can be transparently redirected to the guest OS. This redirection can either be automatic (all newly plugged devices are redirected), or manual (the user selects which devices (s)he wants to redirect). For redirection to work, the virtual machine must have an USB2 EHCI controller (this implies 3 additional UHCI controllers). It also needs to have Spice channels for USB redirection. The number of such channels correspond to the number of USB devices that it will be possible to redirect at the same time. Virtual machines created with virt-manager should have a USB controller by default. In the virtual machine details, select "Controller USB" in the left pane, and make sure its model is set to USB2. You can then click on "Add Hardware" and add as many "USB Redirection" items as the number of USB devices you want to be able to redirect simultaneously. You need to add the needed USB controllers to the libvirt XML (make sure there is no pre-existing USB controller in your virtual machine XML before doing this), as well as one Spice USB redirection channel per device you want to redirect simultaneously. Similarly to libvirt, we need to add EHCI/UHCI controllers to QEMU command line, and we also need to add one Spice redirection channel per device we want to redirect simultaneously. The client needs to have support for USB redirection. In remote-viewer, you can select which USB devices to redirect in "File/USB device" selection once the Spice connection is established. There are also various command line redirection options which are described when running remote-viewer with --help-spice. You may need additional services running in the client, such as the Spice USB Clerk service on Windows. When using Spice, it’s possible to use multiple monitors. For that, the guest must have multiple QXL devices (for Windows guests), or a single QXL device configured to support multiple heads (for Linux guests). Before following the instructions in this section, make sure your virtual machine already has a QXL device. If that is not the case, refer to this section. Your guest OS will also need to have the QXL driver installed or multiple monitor support will not work. Once your virtual machine is using a QXL device, you don’t need to make any other change to get multiple heads in a Linux guest. The following paragraph will deal with adding multiple QXL devices to get multiple monitors in a Windows guest. To add an additional QXL device for Windows guests, simply go to your virtual machine details. Check that you already have a "Video QXL" device, if notclick on "Add Hardware", and add a "Video" device with model "QXL". This can also work with Linux guests if your are willing to configure X.Org to use Xinerama (instead of XRandR). If you are using a new enough distribution (for example Fedora 19), and if your virtual machine already has a QXL device, you should not need to make any changes in virt-manager. If you are using an older distribution, you can’t do the required changes from virt-manager, you’ll need to edit libvirt XML as described on this blog post. You can enable additional displays either from the "Display/Displays" menu in remote-viewer, or from your guest OS display configuration tool. TLS support allows to encrypt all/some of the channels Spice uses for its communication. A separate port is used for the encrypted channels. When connecting through a TLS channel, the Spice client will verify the certificate sent by the host. It will check that this certificate matches the hostname it’s connecting, and that this certificate is signed by a known certificate authority (CA). This can be achieved by either getting the host certificate signed by an official CA, or by passing to the client the certificate of the authority which signed the host certificate. The latter allows the use of self-signed certificates. It’s not currently possible to define the CA certificate/host certificate to use for the TLS connection using virt-manager, see the next section for how to enable this using libvirt. # Enable use of TLS encryption on the SPICE server. # This option allows the certificate directory to be changed. The following script can be used to create the various certificates needed to use a TLS Spice connection. Make sure to substitute the hostname of your Spice host in the subject of the certificate signing request. openssl req -new -x509 -days 1095 -key ca-key.pem -out ca-cert.pem -utf8 -subj "/C=IL/L=Raanana/O=Red Hat/CN=my CA"
openssl req -new -key $SERVER_KEY -out server-key.csr -utf8 -subj "/C=IL/L=Raanana/O=Red Hat/CN=myhostname.example.com"
Spice server and client have support for SASL authentication. When using QEMU, /etc/sasl2/qemu.conf will be used as a configuration file. For testing, you can use the digest-md5 mechanism, and populate a test database using saslpasswd2 -f /etc/qemu/passwd.db -c foo. These files have to be readable by the QEMU process that will handle your VM. To troubleshoot SASL issues, running strace -e open on the QEMU process can be a useful first step. It’s currently not possible to enable SASL from virt-manager. SASL support for SPICE has been added to libvirt mid-October 2013 so you need a libvirt version that was released after this date. To enable SASL, you need to add spice_sasl = 1 in /etc/libvirt/qemu.conf for the system libvirtd instance, and to ~/.config/libvirt/qemu.conf for the session libvirtd instance. When you start the client as usual, if SASL was enabled on the host, remote-viewer will pop up a window asking for a password before starting the Spice session. It won’t be established if an incorrect ticket was passed to the client. The Spice client can share a folder with the remote guest. By default, the client will share the XDG Public Share directory (ie ~/Public if you use a regular system). You may specify a different folder with --spice-share-dir client option. It’s currently not possible to configure folder sharing with virt-manager. In a Windows guest, you must then install spice-webdavd service, and register the drive (by running map-drive.bat from Program Files/Spice webdav). With a Linux guest, you must install the spice-webdavd service (the sources are available at https://git.gnome.org/browse/phodav). The folder will show up in GNOME Files network places (or Nautilus). It can then be mounted and browsed in traditional applications thanks to gvfs-fuse. They are covered in the QEMU online documentation. Basic syntax is -spice <spice_options>. set_password spice <password> [keep|disconnect] Set the spice connection ticket (one time password). An empty password prevents any connection. keep/disconnect indicates what to do if a client is already connected when the command is issued. While you will be able to remotely access your virtual machine through Spice without making any change to the virtual machine configuration, you can get better integration if you tweak it specially for Spice. Installing the Spice vdagent in your guest will let you copy and paste between your guest and client OSes, to drag and drop files between the 2 OSes, … In order for the agent to work, your virtual machine must have a virtio serial device (and the corresponding guest drivers) as well as a Spice spicevmc channel. The recommended way of getting all the needed drivers installed is to use the all-in-one Spice guest tools installer which can be found on spice-space.org. If you want to manually install them, the QXL driver can be downloaded from this location , agent builds can be found here. You also need the vioserial driver which is distributed with the other virtio-win drivers. The package spice-protocol will be downloaded automatically as a dependency of package kvm. oVirt/RHEVM users could be also interested in the spice-xpi package as it allows you to execute spice-client directly from the oVirt/RHEVM UserPortal. This section is for distributions that don’t have Spice packages in their repositories. It will show you step by step how to build the required Spice components. See the README file in spice-gtk for the list of dependencies. spice-vdagent requires virtio-serial support to be enabled. This is described in the chapter [agent]. Guest should have installed qxl driver (xorg-x11-drv-qxl on Fedora and RHEL). Drivers for QXL and drivers for virtio-serial require Win XP SP3. The environment variable $BUILD_ROOT will point to a directory with stored sources and will be used during the whole build process. The variable $INST_ROOT will point to a directory in which Spice will be installed. These instructions may be outdated. Feel free to ask on the Spice mailing list if you need help building from source. Last steps before starting with Spice are to set proper PATH variable. For example RHEL is using /usr/libexec as directory for qemu-kvm binaries. The following setup should be suitable for qemu and Spice built according to the instructions in this chapter. You should now be able to access the qemu-system-x86_64 Spice binary. Host is a machine running an instance of qemu-kvm. Guest is a virtual machine hosted on the host which will be accessed with a Spice client. Client is referring to a system running the Spice client (the recommended one is virt-viewer).